I love the softness and washed few times and still likes new. Although the one I received was not the one I expect. The color is deceiving looks gray but one I received was bluish greenish. But it is okey I love the material. Enjoy cozy warmth all year round with the Superior all-season striped comforter. This down-alternative comforter contains soft polyester microfiber that retains heat and helps ensure a peaceful night's sleep. Conveniently machine washable, this excellent piece incorporates baffle boxed construction and is available in nine fresh and versatile colors options. I LOVE. LOVE, LOVE this comforter! Okay, I respectfully disagree with all of the negative reviews on this comforter. I am very finicky when it comes to bedding. I need it soft, durable and comfortable. This fits the bill in all areas! Butter soft and feels like you are wrapped in a marsh mellow cloud. It is satin people so yes, it will "catch" on your rough feet, as all satin does. I got it in sage which is a pretty light green and will be purchasing in charcoal. The coverage on a King is good with overhang on three sides and can cover pillows. It is very warm in our Michigan winters, but could see it being all season as well. There is double stitching for durability and it is machine washable. In my opinion, one of the best comforter buys I have ever made. 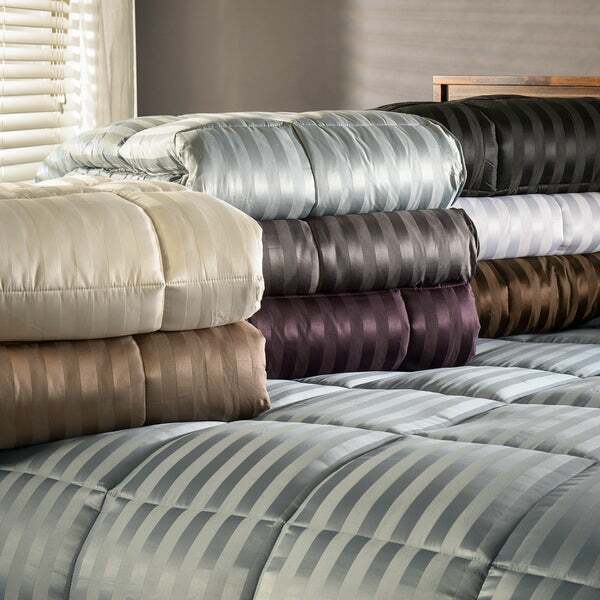 I purchased one of these Striped Down Alternative Comforters and I love it! It is not heavy in weight which I love, but it keeps me warm! I am now buying two more in other colors! I was super excited to get this comforter. It's cool to the touch and not too heavy. Until I slept with it, the fabric it's made out of catches (or sticks) to my feet and hands. One night I ran my hand against the comforter really fast and I actually saw sparks of static electricity. It's super annoying. Unless you sleep with a sheet you will feel the comforter stick to your feet or anywhere else you might have rough skin. This comforter is extremely soft and very nice. I actually bought 2 of them and we alternate the comforters while the other is being waged. Love it! I got the blue color and it is very pretty, sort of a silvery-blue. I can confirm that it is closer in color to the first photo than the individual picture where it appears more aqua. The comforter is not super thick, but it still feels puffy and luxurious when I use it. It has been warm enough for me, and I’ve been sleeping without heat on at around 45 degrees outside (I do live in Florida, though, so not sure how it would do at truly cold temps). It is constructed well. Each square is sewn individually so that the filling stays properly distributed over the whole blanket. I have not had any problems with dry feet scratching on the fabric as other people have said. Really, I feel that this is a great purchase for the price and is very high quality. 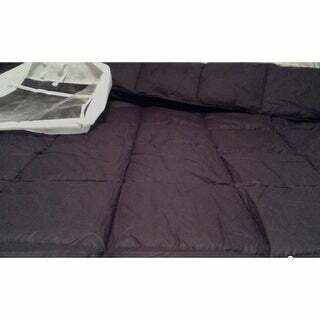 This alternative down comforter seems to be made well, however, it is extremely thin. Appears to have very little fill. Not worth the money in my opinion. I love this comforter! I bought it because of the color. I have never been fond of alternative down comforters before, but this one made up for those bad feelings! It is gorgeous, warm and very well made. I washed it before I used it. And the seams came undone in the washing machine...Stuffing came out. Very poor quality. I was looking for a light blanket to go under my comforter because the comforter was removed from the bed at night. This was a great choice. Warm enough for winter, but soft and cool enough for spring and fall. Loved it so much I bought 2. I have purchased all of my aternative down comforters in the past from overstock but this one is such a disappointment. I've had it about 3 weeks and the filling is pulling out of it. We have no animals or kids on our bed..very very poor quality..I woul send back but through away packaging..i guess you live and learn!! Love, love, love. Bought this for my son and he says, "Thanks, Mom this is the best." This is a nice looking comforter and is pretty warm, but it starts to look pretty rough over time and pills a lot. I love the feel of this comforter. Very slick and smooth. Only issue is that I sleep very hot and this comforter retains the heat and I end up kicking it off. My husband loves it though. Perfect, light but warm! Fabric is soft. Wish it had matching shams though. This comforter is generous size, it's not heavy and it's warm. The negative: it slides of the bed easily and if you have rough heels or any calluses, they will catch on the surface and the fabric will start pilling. Originally bought this comforter for the guest room. Loved it so much I bought a second for our own bed. I sleep really warm and this cover provides warmth but does not feel hot or heavy. Good for all seasons. I love it! I would definitely buy again. This has loose threads that seem to become caught on your nails and other objects. Doesn't clean very well. Not an item I would advise is a good deal. Liked the color and warmth, but it began to pill rather quickly...disappointed for this reason. Bought the entire line and this was the only item I would not recommend. Ive been looking for a comforter like this for years. Washes very well. Love this comforter, this is my second one, it's light weight but So very warm! ""I want to know when you get the PLUM back in stock in Queen size...PLEASE let me know I love it!!!"" "I want to know when you get the PLUM back in stock in Queen size...PLEASE let me know I love it!!!" "It says you have a plum comforter but I do not see one. Do you have one?" I bought a plum in queen size. It is a dark purple color & really pretty. I also bought a cream in king. These comforters are heavy and we use for winter in Ohio. They are too warm for spring/summer. Also, I took to laundry mat to wash & store until winter. Too big for my washer & dryer. Laundered up so nice! Didn't lose shape or fade. Great value. I chose this because I'm hoping that it won't be too warm at night, but still give me something to snuggle with. "Does this comforter have shams to match ( as pictured)?" Hello hindasmith, we do apologize, we are not currently in stock with the shams for this set at this time. However, we are currently in stock with a great selection of shams that would work great with this comforter. Thank you for shopping with us. "Does this have corner loops to tie a duvet cover to?" "In the picture with the all the comforters on top of the bed, smoke blue looks to be a steel gray blue. However, in the picture where it shows each color alone, smoke blue appears to be a bright sky blue. Which color does it more resemble in person?" Thank you for contacting us thepeytonfamily. The color shown on the main gallery image( picture with all comforters stacked on the bed) is the closes to the true color of the product. Please let us know if you have any further questions.